Do you agree that RX200S is the most innovative mod over the previous RX200? You can notice that this RX200S may be the innovative one over its previous stuff RX200. But do you know what's the innovative feature on RX200S? I will introduce you these distinctive features. Still similar appearance design: irregular appearance due to the structure of three 18650 cells and similar layout of buttons and screen, you can see the difference on the screen display: the nature screen display with the adoption of brand-new interface, also the bigger screen size, 0.96inch than 0.69inch on RX200. I personally think the grey RX200S is more beautiful and fashionable than RX200, though RX200S provides more color options. 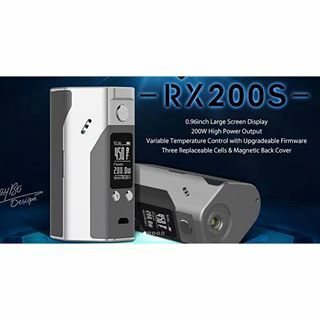 Wanna get this innovative RX200S? Here is the official authorized online store wismec.org for you to get premium Wismec products with beautiful price. How about this tiny iNano Kit? Do you like my recommendation: Wismec DNA200?